A DOWNEND man’s illness inspired his 14-year-old son and his schoolmates to take part in an energetic fundraising campaign. Ian Salt, has severe ME (Myalgic Encephalomyelitis), a chronic illness that has forced him to retire from his job as a teacher. 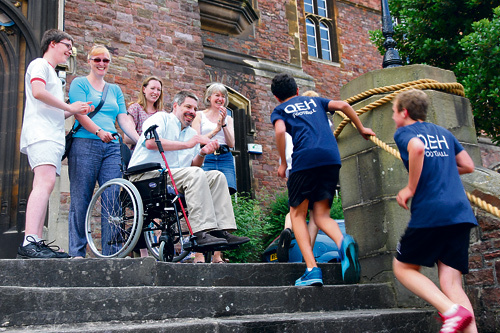 His son Benjamin and fellow Year 9 boys at QEH school in Bristol took part in a charity challenge, which raised more than £1,600 for the charity Action for ME. They had to complete four tasks: running up the school’s main steps until they had achieved a height equivalent to scaling Everest at 8840m; running a marathon in pairs across the school yard; rowing the width of the English Channel and back on rowing machines and finding the route round an invisible maze on a giant chessboard. Mr Salt, who fell prey to ME about 18 months ago, said: “The ME has left me as registered disabled; I need to use a wheelchair if I go outside, which is rare, and am mainly bed/sofa bound and have been medically retired. Specialists have said I will not work again in any job for at least 10 to15 years, such is the impact of this condition. “If by sharing the devastating effect ME has had on my life can highlight this highly debilitating, and misunderstood disorder, so that we can move forward towards greater understanding, both in society and the medical profession helping to lead to medical advancements for a diagnostic test and a cure, so much the better. M E affects an estimated 250,000 men, women and children in the UK. Symptoms can include post-exertional malaise (a period of intense exhaustion that lasts for more than 24 hours following exertion), chronic muscle and/or joint pain, sleep disturbance, ’flu-like’ symptoms, dizziness and/or nausea and problems with memory and concentration. Action for ME offers support and information to those affected while campaigning for better services and supporting biomedical research into the illness.